ANTM Cycle 1 | Where are the models of ANTM now? Note: This season is the only season of America’s Next Top Model available on DVD. You can purchase it here. I think the other seasons will be released on DVD eventually, but TV networks are still getting great ratings because of reruns constantly in rotation. The international destination for this cycle was Paris, France. I don’t like this cycle. Wow … 2003, can’t believe the show has been running that long. So probably they are now too old to continue modeling huh? I loved Adrianne, Shannon, Elyse and Nicole!!!!! Я была бы очень рада если бы Элис или Шэннон победили. Элис и вправду была лучшая!!!!!! why everybody hates robin during competition? Elyse had the worst nose job I’d ever seen. I thought this cycle was really boring. 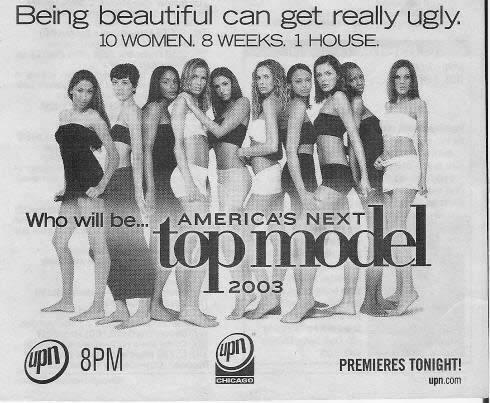 ANTM has gotten much better, with the exception of the latest cycle, cycle 19. I wish they would show this one on t.v. again. i want to see it!!! !